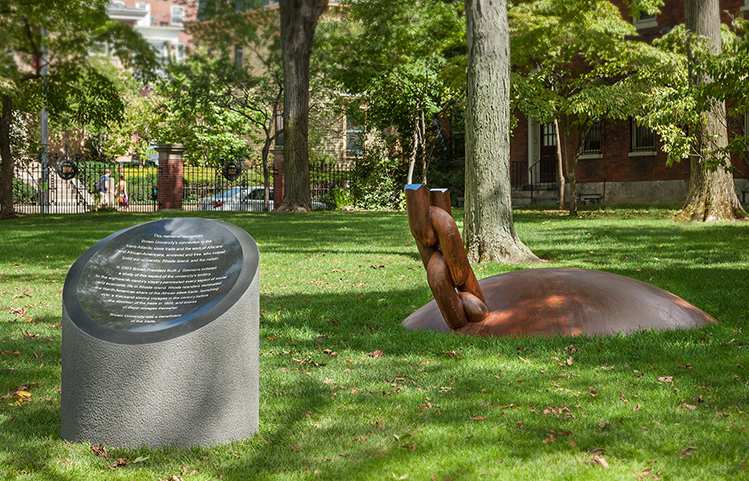 The Slavery Memorial recognizes Brown University’s connection to the trans-Atlantic slave trade and the work of Africans and African-Americans, enslaved and free, who helped build our university, Rhode Island, and the nation. Following the Committee’s charge, preeminent sculptor and National Medal of Arts recipient Martin Puryear created a powerful and elegantly simple object of remembrance. The two-part memorial includes a sculpture and stone plinth with engraved text. A massive ductile-iron chain rises up from a dome measuring eight feet in diameter. The links of the chain are broken at eye level and the surface is mirrored in silver to reflect the sky above. Reminiscent of a ball and chain, the dome also represents the weight of history still half buried, while the reflected sky symbolizes hope for the future. Through his characteristic economy of means Puryear has transformed a recognizable symbol of enslavement into a statement of recognition and hope. 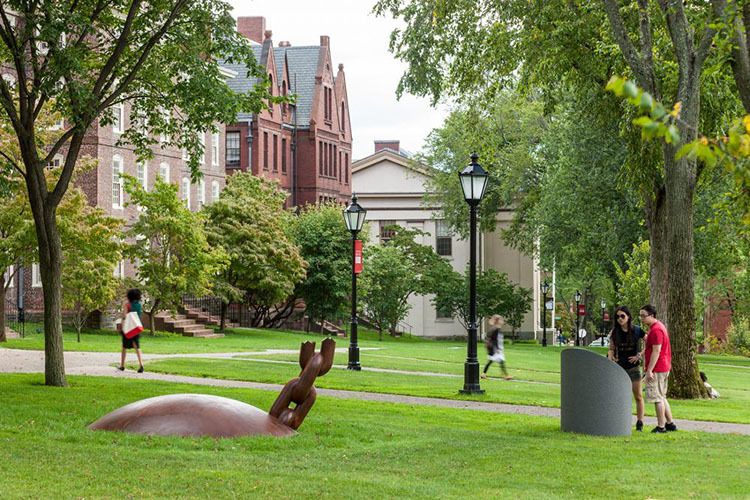 This memorial recognizes Brown University’s connection to the trans-Atlantic slave trade and the work of Africans and African-Americans, enslaved and free, who helped build our university, Rhode Island, and the nation. In 2003 Brown President Ruth J. Simmons initiated a study of this aspect of the university’s history. In the eighteenth century slavery permeated every aspect of social and economic life in Rhode Island. Rhode Islanders dominated the North American share of the African slave trade, launching over a thousand slaving voyages in the century before the abolition of the trade in 1808, and scores of illegal voyages thereafter. Brown University was a beneficiary of this trade.